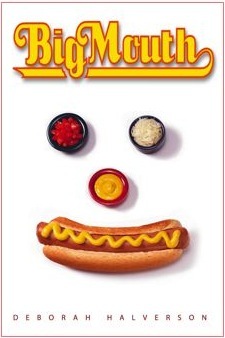 Even if my second novel, BIG MOUTH, wasn’t about competitive eating, this news would’ve caught my eye: Joey Chestnut just ate 103 hamburgers in 8 minutes to win the Krystal Square Off IV World Hamburger Eating Championship. You read that right: 103 hamburgers in 8 minutes. That’s a world record. Or does that go without saying? 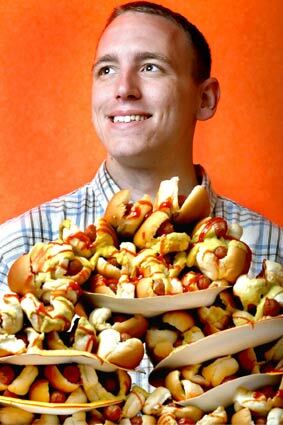 23-year-old “Jaws” Chestnut’s win broke the 97-burger record set by three-time champion Takeru “Tsunami” Kobayashi. Funny how 97 burgers sounds paltry now. And there’s my real interest, the quashing of Tsunami’s records, one by one. Tsunami is the inspiration/hero/nemesis for 14-year-old Sherman “Thuff Enuff” Thuff, the main character in Big Mouth. And now, in real life, through sheer gustatory greatness Chestnut is doing to Takeru what Shermie is training for in my story: dethroning the king of the eating world. It’s fascinating, watching my character’s dream play out in reality. And I love that it’s happening on ESPN, the Mecca of sports reporting. Shermie dreams of being on ESPN, a bona fide athlete, his trouncing of Tsunami reported live to the world. And there’s Chestnut, front and center on the ESPN radar. Yet again, the line between fact and fiction is blurred. I love it! And I especially love that I get to have a hand in the blurring. Having lunch one day at a sports bar with my cousin, we were treated to an afternoon of “competitive eating” å la ESPN. Made eating my paltry soup and sandwich look … amateurish, at best. Some of the contests were fascinating, some were disgusting (spaghetti comes to miind), but all were jaw-dropping. I oculdn’t help but watching one of the millions (or so it seemed) TV screens. They were everywhere. It was kind of like driving by a 7-car pile-up, or a train wreck. I just HAD to slow down and look. I couldn’t help myself. By the way, I just love reading your blog. As another mom of triplets, I can so relate. Mine are 5 1/2 years old now. I smile as I remember. I’m so glad you’re all safe and back in your home after your evacuation adventure. My trio and I have been keeping you and all of southern California in our prayers lately.